Meet Your Neighbor Jennifer Benge of Stronghurst. 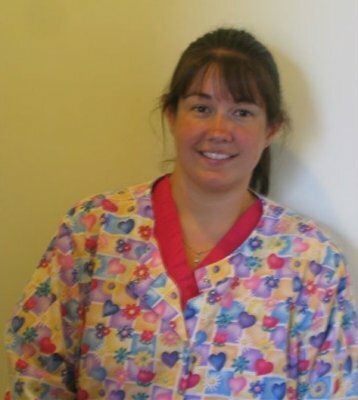 Jennifer is a dental hygienist at Good Dental Care, at rural Biggsville. She was employed as a hygienist for her father, Dr. Paul Good, who started the business. She now works with her brother, Dr. Brian Good, who is the current dentist. Jennifer was born in Aledo. The family moved to Oquawka when she was in third grade as her father had started doing dental work at the Health Center in Oquawka. Jennifer graduated from Union High School in 1993 and from Illinois Central College in East Peoria, in 1995 as a dental hygienist. She has been married to John Benge for ten years and they have two daughters, Madison, 8, will start third grade at West Central School District, and Macy, age 5, who will be starting kindergarten. Jennifer's parents are Cathy Good and the late Dr. Paul Good. Her one brother, Brian, is married to Larisa, and she has one sister, Emily. Jennifer enjoys reading, taking walks, being a Girl Scout leader, watching the girl's activities which include softball and dance. She also enjoys spending time with family and traveling. She is an active member in the Stronghurst Christian Church. A month before her father passed away the family took a vacation to the Bahamas and Florida. Jennifer took many photos of the family. This was the last family vacation that was taken with her father and she has many precious memories of the fun they had.